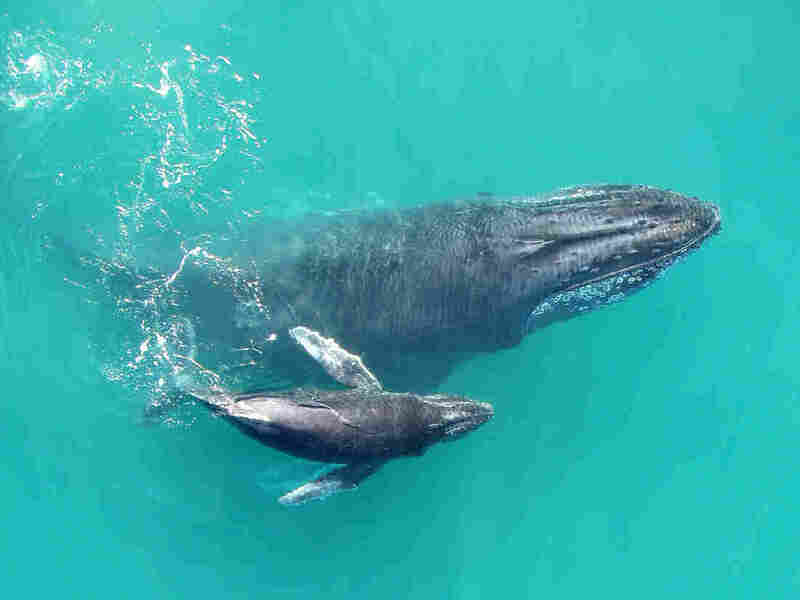 Recordings Reveal That Baby Humpback Whales 'Whisper' To Their Mothers : The Two-Way Scientists recently tracked eight baby whales using special sound and movement recorders. The sounds the babies made turned out to be far different from the eerie songs of adult male humpbacks. A mother and calf humpback whale swim in the Exmouth Gulf in Western Australia. Baby humpback whales seem to whisper to their mothers, according to scientists who have captured the infant whales' quiet grunts and squeaks. The recordings, described in the journal Functional Ecology, are the first ever made with devices attached directly to the calves. "When they're born, these whales are around 5 meters long," says Simone Videsen at Aarhus University in Denmark, who notes that this is "pretty big considering it's a baby." Calves must travel with their mothers for thousands of miles during an annual migration to the food-rich waters of the Antarctic. Exactly what happens during that period is a mystery. "These early life stages of wild whales are so elusive because they're an aquatic animal," Videsen explains. "We can't follow them around all the time to see what they're doing." However, she and some colleagues recently were able to track eight baby whales, using special sound and movement recorders. These recorders had suction cups that let the researchers just stick them onto the babies' skin. "It can stay there for about a day and then it falls off," Videsen says. The researchers weren't sure exactly what they'd hear when they retrieved the devices and played the audio. It turns out that the babbling of baby whales is very different than the haunting, eerie songs sung by adult male humpbacks. "It's like a squeaky sound, and some of them are really like grunting sounds," Videsen says. What's more, the sounds are very quiet — like the baby humpback is whispering so that it won't get overheard by something dangerous lurking nearby. "There are lots of killer whales in the area which are predating on these calves," says Videsen, "and they can use these sounds between mother and calf as like homing cues." So why do the calves say anything at all? The researchers found that baby whales mostly whisper when they're swimming, rather than when they're resting or nursing, so it may be that these intimate sounds help mothers keep track of their young in murky waters.